S.A.N. - NA-R-ALA L'ACIDO R-ALFA LIPOICO E' LA FORMA BIOLOGICAMENTE ATTIVA DELL'ACIDO LIPOICO. NA-R-ALA E' LA FORMA STABILE DI R-ALA SOTTO FORMA DI SALE DI R-ALA!! QUESTO, HA AMPIAMENTE DIMOSTRATO TUTTE LE BENEFICHE POSSIBILITA' NEI CONFRONTI DI CELLULE DANNEGGIATI DAI RADICALI LIBERI. MA NON SOLO. LE CARATTERISTICHE CULTURISTICAMENTE PIU' INTERESSANTI, RIGUARDANO L'OTTIMIZZAZIONE DELL'AZIONE DELL'INSULINA E QUESTA FORMA DI ACIDO LIPOICO E' MAGGIORMENTE "RICONOSCIUTO" DAGLI ENZIMI MITOCONDRIALI NEL CITOPLASMA CELLULARE. L'ACIDO R- LIPOICO HA DIMOSTRATO ATTIVITA' DI RICICLO DEL GLUTATIONE, IL PIU' IMPORTANTE REGOLATORE DELLA SALUTE CELLULARE, DI QUELLA EPATICA IN PARTICOLARE. SAN's stabilized Na-R-ALA contains the worlds first form of Na-R-ALA, the sodium salt of R-Lipoic Acid (RLA). Unlike ordinary RLA, SAN's Na-R-ALA is the only stabilized form of RLA that doesn't polymerize into a sticky and useless substance at high temperatures. 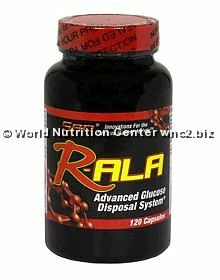 Na-R-ALA is fully water soluable and hence completely absorbed by the intestinal tract. Note: SAN's Na-R-ALA is stabilized with Na (sodium). One serving contains less than 1% of the daily value for sodium, an insignificant source and therefore not listed on the label. The sodium content of SAN's Na-R-ALA will not effect blood pressure levels. Other Ingredients: Microcrystalline cellulose, gelatin, fd&c colors, titanium dioxide.